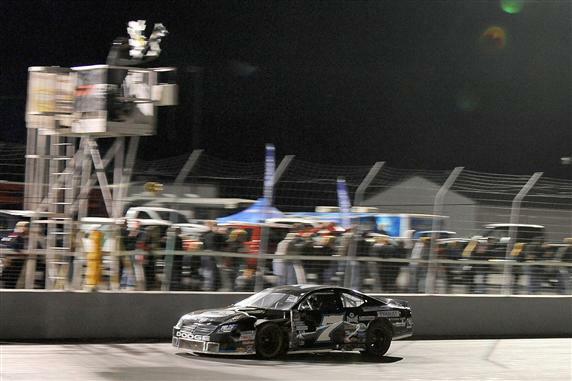 ﻿ After 12 races in the 2010 NASCAR Canadian Tire Series season, the final race at 0.375 mile Kawartha Speedway wraps up Canada's major stock car racing tour with drivers still desiring to prove themselves. As some drivers will want to end the 2010 season with a hard-earned top result, two drivers have a championship honour where only one driver will hold the 2010 NASCAR Canadian Tire Series crown. DJ Kennington or JR Fitzpatrick sparred all season long in the points with Fitzpatrick's #84 Chevrolet gaining an advantage on road courses while Kennington's #17 Dodge found the edge on oval tracks. Though JR Fitzpatrick is skilled on ovals, the circle tracks appeared to be a liability to the Cambridge, Ontario native's title hopes. With three ovals concluding the 2010 NASCAR Canada season, Fitzpatrick continued to lead points following the first of those races at Barrie Speedway. However, a moment of lost power at the Riverside Speedway race in Nova Scotia gave Kennington's Castrol Edge car the edge needed to take the points lead entering Kawartha with a 40-point margin. Prepared to make JR Fitzpatrick's job hard to reclaim the points lead at the last minute, DJ Kennington nailed down the fastest lap in qualifying for the Kawartha 250 race with the preferential lead at the start. As Kennington beat out Ron Beauchamp Jr to take pole, JR Fitzpatrick timed into the field 8th place with odds for the 2010 NASCAR Canadian Tire Series title apparently dwindling. Once the flag dropped, Kennington led the first 53 laps until the second caution provided an ideal time for the #17 Dodge to pit. After one lap where Donald Chisholm stayed out for 1st place, Kennington would resume at the front for an additional 25 laps. Showing himself to be the class of the field, the #17 Dodge would relinquish the top position for the Kawartha 250 running order without the knowledge the Castrol Edge time in the lead had concluded the this late afternoon event. Breaking DJ Kennington stranglehold on the lead position of the Kawartha Speedway, Brad Graham in the #19 Dodge took the front spot for 11 laps. Following Graham, 2nd place in NASCAR Canadian Tire Series points JR Fitzpatrick emerged to take the top spot on lap 91 gaining a valuable 5 point bonus for leading. Involved in the first two cautions of the Kawartha 250, the #7 Dodge of Peter Shepherd appeared to be having a lousy outing at the 0.375 mile track. A young Canadian stock car driver limited to only a partial schedule this season, Shepherd started 6th in the event hoping to parlay some fast practice speeds into a solid race run. Despite being caught up in two incidents, Shepherd and his #7 car crawled back on both occasions placing himself into contention not only for a top-10 run but perhaps a victory. Several laps after a restart, Peter Shepherd launched past Fitzpatrick on lap 109 to lead for the first time in the Kawartha 250. Transitioning through the NASCAR Canadian Tire Series finale, DJ Kennington was 11th and JR Fitzpatrick was 17th on lap 130 following a caution called for the #13 car of Trevor Monaghan. Through the final 120 laps, both drivers proceeded back into the top-5 for the final laps as Fitzpatrick run 2nd on track with Kennington in 4th. While Fitzpatrick's 2nd place position in the white flag lap wasn't effort to catch DJ Kennington in the points, insult to injury was added by the #02 Ford of Kerry Micks. Fighting for the runner-up spot into turn 4, Micks impacted with the #84 Chevy leading to Fitzpatrick's car spinning. With the 2010 NASCAR Canadian Tire Series season starting at Delaware Speedway with Micks looping Fitzpatrick, some bad feelings fester on the impact as Micks takes the 2nd spot and the #84 of Fitzpatrick crosses the line in 15th place. Winning the Kawartha 250 as a dark horse, Peter Shepherd led 124 of the race's 250 laps in his #7 Dodge taking the lead for the final on lap 214 en route to the checkered flag. Experienced in NASCAR south of the border when the Brampton native was hired by Roush Racing from 2006 to 2007, this win at the Kawartha Speedway is his first touring series trophy from a NASCAR-sanctioned event. Placed in 3rd in the final results in the Kawartha 250, DJ Kennington triumphed in the 2010 NASCAR Canadian Tire Series championship points. Taking honours 87 points ahead of JR Fitzpatrick at the end, Kennington and the #17 Dodge team celebrates a long-fought first national stock car championship. 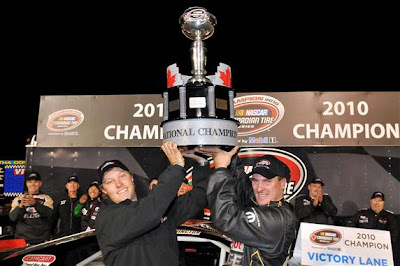 A mainstay the NASCAR Canadian Tire Series since the foundation in 2007, Kennington was more importantly long-time competitor in tour's predecessor series known as the CASCAR Super Series. Since the mid-1990s DJ Kennington campaigned a #17 Dodge with Castrol sponsorship starting as a very young driver. Still only 33 year old, Kennington is officially the 2010 NASCAR Canadian Tire Series champion. In the final race of the season, Mark Dilley and Don Thomson Jr. rounded out the top-5. 6th through 10th consisted in the order of Scott Steckly, Jason Hathaway, Jeff Lapcevich, Ron Sheridan and Ron Beauchamp Jr.